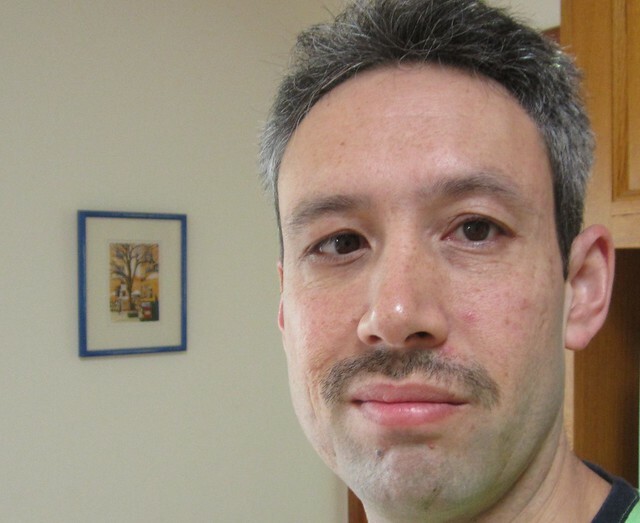 If you won’t donate for me growing a moustache, how about for getting this picture? Train, tram and bus in one pic. 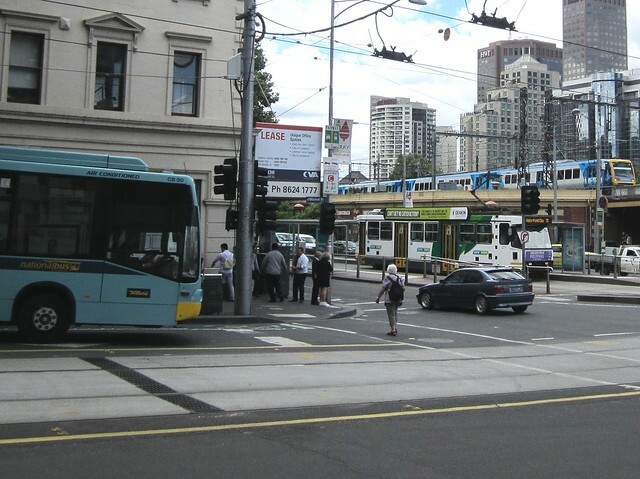 Despite a train theoretically every minute or two between Flinders Street and Southern Cross, three tram routes (excluding the City Circle) and numerous bus routes passing this intersection, it took a surprising amount of time to get a photo of all three modes together. I was also being fussy. I didn’t want a City Circle tram, I wanted a “real” PT route tram. I didn’t want a coach or a V/Line train, I wanted a route bus and a Metro train. Additionally I was trying to get the front of a bus, not the back. I’d have preferred a train on a closer track, but didn’t have all day to hang about. And one passing beggar bogan had already asked me for a dollar, so I decided this would be good enough. But maybe I’ll try again another day. Day 11, and in the last day or two, for the first time the moustache is actually making its presence felt to me. For one, I can now see it in my field of vision without a mirror. The other thing is I can feel it. I assume it’s now at a point where some of the hairs are reaching back and touching the skin, so there’s a slight itching sensation. Nothing too onerous yet, but clearly I’m now getting furry. It might need a trim over the weekend. It’ll be interesting to see how it develops, but I can foresee that if the itching gets worse and I don’t get past it and accustomed to it, by the time the month is up, I’ll be wanting to shave the mo’ off as soon as possible. There’s also pedestrians, private cars and just barely visible a taxi! Just missing a cyclist, though I know that’s not your point. I’m told itchiness normally lasts about two weeks (assuming you let it continue to grow a bit), but I never noticed it in my particular case so I can’t tell you that from personal experience. By the end of the month it shouldn’t be itchy any more. Well at least not for you, Marita might not be in the same boat! In my various forays into growing facial hair (I have very little respect for hair, and grow it or cut it with reckless abandon! Well, reckless abandon when cutting, I am having more and more difficulty growing hair on the TOP of my head…) I never really experienced the itchy sensasion people talk about. I do find a mo iritaes my top lip though, so I tend to trim it off my lip – which also has the added bonus of reducing its presence in food and drink. WRT seeing it in your field of view, I tend to grow sideburns (compensating for lack of hair on the top perhaps?) and let them go quite bushy before trimming. I think I let them go a bit far when I thought I was being followed along the street one day – kept seeing something out of the corner of my eye… The paranoia reduced when I shaved off the burns!